The in-flight internet company's stock got a nice lift despite turbulence for the broader market. 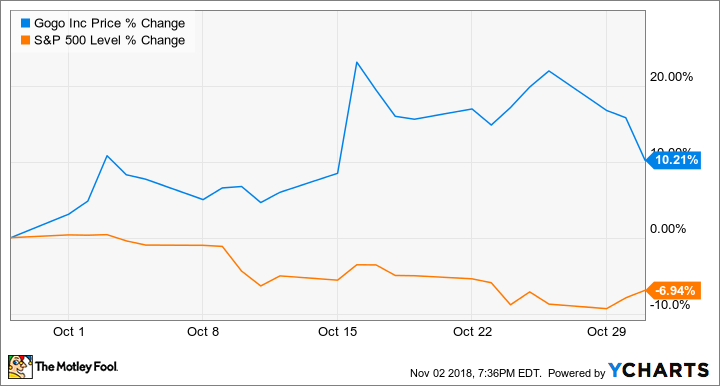 Shares of Gogo Inc. (NASDAQ:GOGO) gained 10.2% in October, according to data provided by S&P Global Market Intelligence. The company, which provides internet services for use during business and commercial flights, saw its stock price lifted on news that it had hit system installation milestones. Gogo published a press release on Oct. 15, revealing that it had installed over 5,000 systems for in-flight internet on business flights thanks to rapid adoption of its most recent connectivity platform. On Oct. 25, Gogo also revealed a partnership with Brazilian airline GOL to bring wireless internet to the company's flights. AVANCE L5, Gogo's solution that can provide bandwidth-intensive activity such as streaming video, has been in the market for a little more than a year. To date, Gogo has more than 350 L5 systems installed and activated, with an additional 300 that have been shipped. AVANCE L3, which began shipping earlier this year, continues to gain momentum and is expected to reach 100 installations by mid-November, less than one year after launch. Gogo shares are still down roughly 50% on the year despite recent gains, owing to a full-year outlook that the company published in May. That report featured full-year sales and EBITDA guidance that came in below expectations due to performance issues with the company's 2Ku connectivity system. Some of Gogo's October gains have reversed this month, with shares trading down roughly 6.5% in November so far. 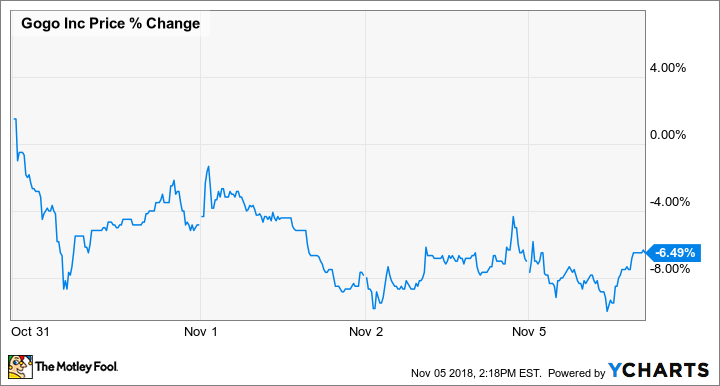 There doesn't seem to be any business-specific news behind these sell-offs, but BidaskClub did publish a note on Nov. 1 lowering its rating on the stock from "buy" to "hold," and it's possible that the negative ratings coverage is a factor. Gogo is scheduled to report third-quarter earnings and host a conference call on Nov. 6 before the market opens. The company hasn't issued third-quarter targets, but it's guiding for full-year sales of $865 million to $935 million (growth of roughly 29% at the midpoint) and adjusted EBITDA of $35 million to $45 million (down roughly 32% at the midpoint).